October 8th, 2017 was a life-changing experience for myself and the community where I have lived my whole life. Due to a perfect combination of years of drought, followed by a historic wet season- encouraging major vegetative growth– and spread by a strong inland wind, a massive firestorm erupted. It consumed and transformed hundreds of thousands of acres of land, thousands of homes, businesses, livelihoods, and environments. This is what it means to live in a Fire Ecology. California as a whole is predominately an environment coevolved with wildfire. It was a deeply emotional experience living through such an event, and the long-term recovery and collective trauma will be felt for years to come. With the level of destruction to lives, homes, and property, it is easy to want to do everything in our power to stop the fires from ever returning. But, is that even possible? What if I told you that the mind frame “we can prevent the fire” is the most dangerous and ineffective approach to protecting people and property? What if I told you, in order to reduce the risk of catastrophic fires in our lives, we have to embrace fire? Fire is not the enemy. Wildfire is a raw and powerful expression of nature and learning to design our communities and steward our environment with fire in mind is our best chance to decrease the threat of catastrophe. But, how do we learn to live with firestorms and who can teach our land stewards and community developers how to embrace the power of fire? Indigenous people have known how to live in harmony with wildfire for tens of thousands of years. The wisdom and stories still carried by native communities provide some of the best-kept records of the world’s natural history. To truly listen to this generational wisdom is to wake up to a deeper dimension of time and relationship to the land. It is a way of living with the environment and natural fire cycles that span tens of thousands of years. 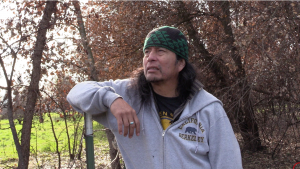 During the recovery of the 2017 California Firestorm, I had the privilege to learn from a Native American Ecologist named Edward Willie (Pomo, Wintu, Wailaki). Edward was gracious to attend many fire recovery events to share his knowledge and history of the role fire plays in ecology. His lessons changed my view of fire and catastrophe. As an ecological designer, I feel pretty confident in my understanding of ecosystems, fire ecology, and everything encompassed therein. What Edward taught me and our community was much deeper than I had expected. It has expanded in fundamental ways my relationship to the land, my view of development, and has given me a new sense of hope. Here are three lessons I learned from Edward and how they changed my view of the world. Want to learn more about Fire Ecology and Stewardship Strategies? I have put together more resources for you, and The Permaculture Skills Center is holding a 4-Part FREE Workshop Series in 2018. Click this link to learn more. Let me be clear, while the fires themselves cannot be prevented, the level of catastrophe impacts can. More on that later. So why can’t wildfires be prevented? Nothing sends that message home more than learning how long these fires have been returning to the same exact places. 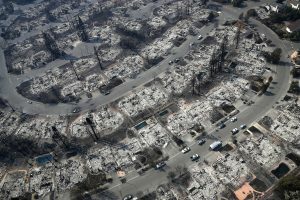 According to Edward, the Pomo have been observing the fire zone most recently known as the “Tubbs Fire” (October 8th, 2017, Santa Rosa, CA) for at least the last 10,000 years. 10,000 years this fire has been returning! 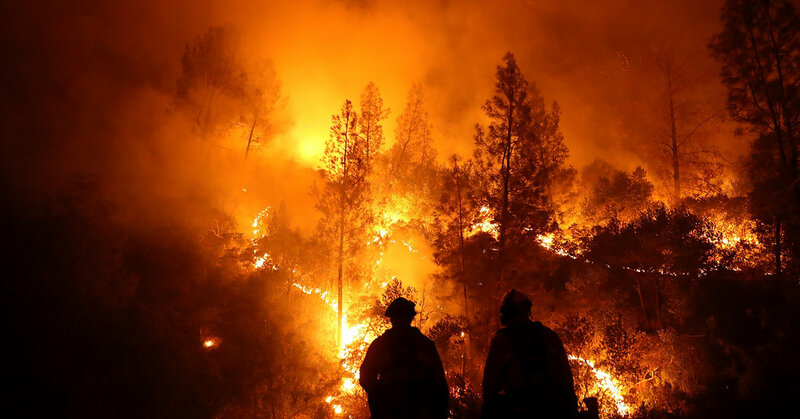 In Napa, CA, the “Atlas Fire” that burned there in October of 2017 has been observed by the indigenous people of those lands, the Wappo, for over 10,000 years. Edward tells us the Wappo even have a word in their language for the hot east winds that come each October. Imagine that. To be so in tune with the cycles of fire that you give the exact fire conditions in an exact location a name to pass through the generations. Edward describes these fires as “Geysers”, natural phenomena that reoccur in regular intervals like any other kind of geyser. Knowing the firestorm was always destined to return, Edward’s Pomo ancestors cultivated an approximate five square mile patch of dogbane plants directly in the path of where the Tubbs Fire hit in 2017. 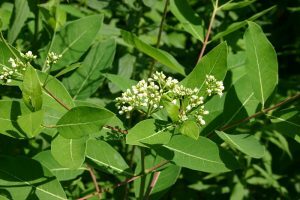 Dogbane is an important native plant to the Pomo people. They make fishing and hunting nets out of the thick fibers of the plant stalks. Edward says it takes approximately 60,000 stalks of Dogbane to make one net for a whole family. Fire plays an important role in managing the Dogbane as I learned from a recent visit with Edward of a small, protected area of what is left of the ancient Pomo Dogbane patch. Fire clears out competing plants and causes the Dogbane to grow tall lanky stalks the next year of growth. 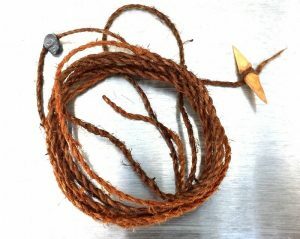 This creates longer fibers for the Pomo people to harvest to make their nets and cordage. How’s that for a relationship between people and fire? One of the more important lessons Edward shares is the understanding that every place is different. Topography, microclimate, vegetation type, etc., all contribute to the environmental processes and functions of a place. Edward encourages us to learn the stories of each place; each valley, each ridgetop, each tree, each generation of animal has its own story to tell us about the land. With this listening, we can deepen our sense of time and the succession an environment may be in. To understand the ecological pattern of a place is to better understand the role fire may play there. The more we listen and learn the more we can change our land stewardship practices and planning endeavors from a fight against nature, to instead, collaboration with it. Just like Native Communities have done for millennia. Learning the story of a place means that the solution for one location may not be the same solution for another location. Those areas may even be geographically close together yet due to climate, water, and other site-specific conditions, the expression of natural hazards like fire and drought will be completely different. Without understanding the story of each place, each slope, each ridge, each valley – we are now intentionally cultivating ignorance of the forces of nature. As the recent firestorms regrettably demonstrated, we are in a fight for our lives but only because we have made it so. Nature will always have the last word. That is why we need to remember that we are nature too. Remember that we can live in right relationship with ecosystems. We will never go back to the ways of our ancestors, but we can strive for a new kind of harmony; a new balance of ancient wisdom with the modern world. How do we learn the story of place? To answer this question we have to first and foremost clear our minds of thinking that we already know the solutions. By ridding ourselves of thinking we already understand the environment, we open ourselves up to the real moment to moment information each specific area of land might be contributing. This process puts us in a “listening space” where new ideas and understandings can take hold through thoughtful observation. Above Picture-Low intensity fire spreading across floor. The more I learn from Edward and other indigenous wisdom keepers, I realize that most of our environments have a story that has been told, retold, edited, and revised for millennia as generation after generation added to it. In this way, it’s as if the oral records of the past are a prediction of the future and can point us to tangible solutions. Our modern-day culture may be putting too much trust in the promise of technology to solve our problems. The solutions to many of our challenges of integrating with harmoniously with nature have already been figured out by our ancestors who lived through catastrophes, the like we have never witnessed. I believe we can be good land managers again. We can be sensitive planners and developers again. We can tend the forest, manage grasslands, and regenerate our watersheds by understanding the story of each place. The skills and tools are readily available. It’s our short-sided thinking, closed mindsets, and our illiteracy of ecological patterns holding us back. Part of why we are experiencing such tragedy with wildfires is because many fire ecology zones of California do not see at regular enough intervals. Without fire at shorter intervals, the vegetation grows larger, woodier, and more congested. All of this material we call “fuel load.” With so much material to burn, once a fire has ignition, this buildup of “fuel load” can lead to larger, faster moving, and more catastrophic fires. Edward shares how native people intentionally use fire as a tool to steward the land. They introduce fire at regular intervals to manage the growth of vegetation, reduce fuel load, and activate fire-dependent plant communities. With fire occurring more often, fuel load is less of an issue, and these fires burn at a lower intensity and therefore lead to less destruction. 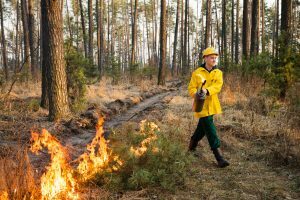 Today we call the practice of using fire for management “prescribed burning” and it has widespread use in many places across the globe. It’s important to note that introducing fire to a landscape for the purpose of management must be done at the correct time of year with a lot of important best practices in place. The danger is very low if done right. In fact, 99% of prescribed burns are completely controllable by fire tenders. Utilizing prescribed fire more in the landscape of California (like native people have done for millennia) is a major solution to avoiding large-scale disasters like we saw during the 2017 California Firestorms. 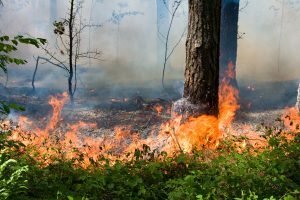 Introducing more fire will also support a healthier relationship with native plants and animals as they have co-evolved with fire even longer than humans have. Edward says that if there were a manual for how to care for and manage California, would be considered a go-to management tool. Above Picture- Man igniting a prescribed fire with fire break behind. Are we brave enough as a society to truly build in harmony with our landscapes? Are we humble enough to invite the native people of these lands to the table to collaborate, make peace, and grow together in a sustainable and regenerative way? What is it going to take to get there? Are lost lives, homes, and livelihood’s not enough of a wakeup call to avoid building the same way we have the last 100 years. Is the toxic contamination of many watersheds, water systems, and waterways not enough? Is the devastation of local economies not enough? It is time to let go of the narrative that we can somehow stop the forces of nature. It is time to let go of the idea that somehow our technological state of civilization knows better, can build better, and will do better than native people have done for generations. Sure, maybe we can bloat the carrying capacity of landscapes for a time. However, eventually, the flood will rise, the land will shake, and the fire will roar. Join expert Land Stewards to learn more about Fire Ecology and Stewardship Strategies. The Permaculture Skills Center is holding a 4-Part FREE Workshop Series in 2018. Click this link to learn more.